Council bosses have said sorry to Sheffield and Rotherham residents who have waited more than a week to have their bins collected. Thousands of bins around Sheffield were left uncollected as a result of heavy snow on Boxing Day evening, which made some roads impassable for waste lorries for several days. 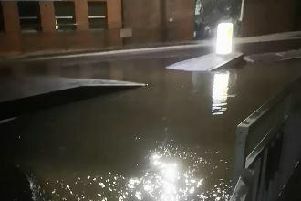 Extra crews have been out in the city to ensure the backlog is cleared, with bosses saying they expected the majority to now have been collected. Coun Jayne Dunn, Sheffield Council cabinet member for environment and recycling, said: “I’m sorry for the delays to some collections which was due to the heavy snow fall last weekend. Black bins and recycling bins and boxes were collected as scheduled on Friday and Saturday. The council and waste contractor Veolia said they anticipated the backlog of all black bins and the ‘majority’ of recycling containers to have been cleared by yesterday afternoon. Any outstanding recycling containers will be collected early this week. Residents are advised to leave their containers out until they have been collected. Francis Drew, contract manager at Veolia, said: “We’re working to catch up with the backlog of collections as quickly as we can. Delays have also affected Rotherham, with clearing the backlog in the town scheduled to last into next week. Extra crews will be out this week to collect black bins missed in the snow. However, missed recycling bin collections from December 27 to January 3 will only be picked up during the next round of scheduled collections. Coun Mahroof Hussain, Rotherham Council cabinet member for environment, apologised for the disruption, but said crews are catching up. He said: “Several days of ice at a time when regular collections were rescheduled for the holidays, has resulted in collections being two days behind.